Okay so.... I had a request to run a D&D game recently. (I know eh? Who'd a though *I* would be someone to run a D&D game! Yeesh!) And since I knew the requestor is a big fan of Greek Mythology, I put together a campaign set in Mythological Greece. And so we played our first session on Saturday evening. If you're at all interested, I thought I'd post the game's progress here. Some technical info: I grew up with 1st and 2nd edition AD&D and while I am fond of 5th, I'm not comfortable enough with it to run it confidently. So I'm using 2nd ed AD&D and using the "Age of Heroes" supplement for a starting point. Questions, comments and critiques are welcome in this thread! Join me in discussion! Session 1: The Apollonedes and the Two-Headed Bull. The year is 1264 BCE. In the lush and magical wilderness of Arcadia, a young boy and a young girl, twins, were raised in the woods by the animals and spirits of the magical forest. They are now 16 years old and are celebrating.... well anything really.... with their Nymph and Faun friends. The girl twin, Antiope and a large group of Fauns and Nymphs decorate a clearing and get an early start on the fun. Antiope plays her crude wooden lyre while her Faun buddy Anoitos accompanies her on his pipes. She plays so beautifully that a golden 'booted' Eagle comes out of the sky and settles near her to enjoy the music. She loves animals so much that she plays to the Eagle and they form a powerful bond. Meanwhile the boy twin, Achillios, and his little Faun hunting party go searching for rabbits and deer for a party-worthy feast. 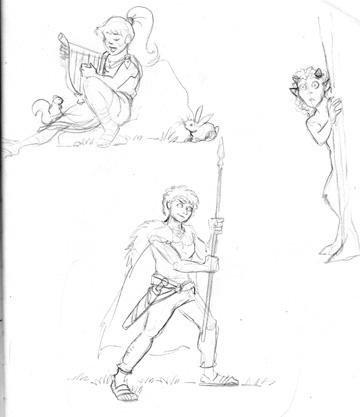 Achillios easily bags a rabbit with his spear and his #2 and best friend Boukolika -a Fauness archer- cheers him on and passes the catch on to another Faun to carry back to the clearing. But just as they're enjoying their little success, a huge bull with fiery orange hide and two heads comes roaring out of the foliage. Most of the Fauns scatter in terror, but Achillios and Boukolika stand their ground and fight. Achillios does it some damage, but Boukolika breaks her bowstring and is unable to help. The bull hears music and makes a dash for the party clearing! In the clearing the Bull takes the partying Nymphs by surprise and one narrowly misses getting seriously gored. Antiope manages to nock a few arrows and hurt the beast a couple of times before it bashes her aside and wounds her quite badly. Achillios arrives and after a few quick stabs at the beast, he manages to land a fatal blow that brings the creature down. Before they can celebrate their victory, however, the Nymphs gather Antiope up and carry her to the nearby grotto. The Grotto is a recently consecrated shrine to the god Apollo, nestled in the land of his sister Artemis. It is attended by Nymphs but the overseer is Nicodemus, an old Centaur of 65 years who was once a warrior in his homelands of Mount Pelion. He has retired from his fighting days owing to stiffening joints and reduced strength and now acts as a Healing Priest of Apollo in the Arcadian woodland. 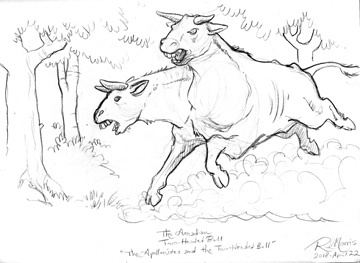 The excitable Faun Anoitos come skittering into his cave as he is relaxing in his hot spring bath and while he is unable to convince the old Centaur that they were indeed attacked by a two-headed bull, he does get out of the water to see to Antiope's wounds. Applying his skills and magic, Nicodemus heals Antiope up [to full HP!] and when all is said and done, none other than the gods themselves have come to congradulate them all! Zeus has arrived, attended by Apollos, Artemis, Athena and all nine Muses. They not only reveal that the two-headed bull was a test of their strength, skill and courage, but also that they are the twin children of Apollo himself and the Muse Terpsichore! Zeus commands that the twins go on a mission for him -the details of which he's left out, promising that they would learn more of it on the trip- and that Nicodemus go with them for support. They are given gifts to help them against the dangers they will encounter. Zeus gives Achillios a golden spear that ripples with electricity, Terpsichore gives Antiope a golden magical lyre. Achillios recieves a helmet from Athena, Antiope a shield from Apollo, and Artemis gives Nicodemus a bow. So is it one player with two Pcs (fighter and bard?) and an NPC Cleric or what? Sounds interesting. Looking forward to seeing how you handle all the fae types the Hellenes had. The six year old must love being a twin. Heh, I gave them the option of being just friends, siblings, or twins. There was no question that they wanted to be brother and sister, but after arguing for a moment or two about who was going to be older, they mutually decided on twins. I've actually played a few RP sessions with them before. Star Wars (went over very well), Toon(which was surprisingly a disaster), and a "Mix-up" game where one was an Elf and the other a 'droid. And they've made up character concepts for other as-yet unplayed scenarios, one of which they decided to be brother and sister, but swapped which would be oldest. They cooperate pretty well on this stuff for the most part. I've found games of Toon can often be a disaster. You need a specific kind f buy in to make it work. Yeah. I used to run a regular Toon session at a gaming convention in Montreal. Went over brilliantly every time, but the university students were exactly the sort of mentality it needed. Session 2: "...As Sweet as the Siren's Song." The Heroes, Antiope and Achillios enjoy a nice feast with Nicodemus and the Fauns and Nymphs. They have rabbit and lovely beef steaks! They magically tan the hide of the two-headed bull and make a variety of fine leather gifts for the heroes... Bracers for Antiope -that her Eagle friend may perch upon, a cape/cloak for Achillios which on one side bears the fiery orange colouring of the Bull, but on the other side is dark and camoflaged for hunting or sneaking. For Nicodemus they make a needle and thread set out of sinews and bone. And the Faun Anoitos turns the four bull horns into instruments that they can use to call a long way off, or with a stopper in, can be used as drinking vessels. 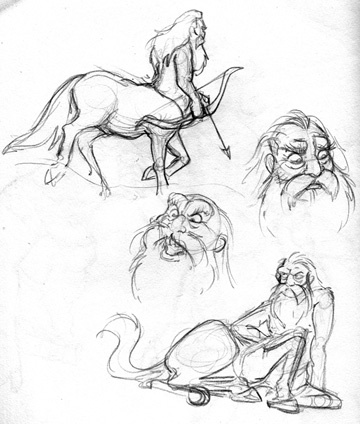 The next morning they set off on their journey towards Lerna, a town Nicodemus the Centaur remembers as having a significant port for hiring a ship of some sort. On their way, however, the twins are mesmerized by the sound of beautiful singing. They begin to wander towards the sound, but Nicodemus uses magic to entangle them in the forest greenery. The Faun Boukolika comes rushing back from scouting ahead and announces that there are HARPIES waiting in ambush! All chaos breaks loose. Nicodemus uses magical silence to break the Harpy charm song and shoots the creatures with the Bow of Aretemis. Antiope battles them with bow and sun energy from the Shield of Apollo! Achillios strikes them with his Spear of Zeus and his sword. Boukolika alternately fights them with her spear and head-butts them, but Anoitos gets badly wounded and drops to the forest floor unconscious. The Harpies break ranks, most flee in panic when several of their number are killed. When all is said and done, the heroes make camp, Nicodemus does what he can to try to heal Anoitos, and they settle in for the night. But along the road comes a travellor..... A tall and beautiful woman! Who is she? We'll find out next time! A tall and beautiful woman. So a goddess, or a monster. I'm not sure which is scarier.